Islamabad. 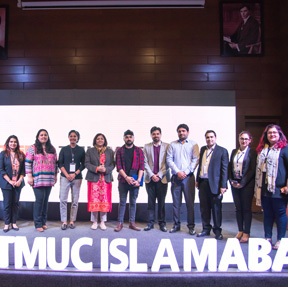 The Millennium Universal College Islamabad hosted an unconventional, motivating TED talk, with the theme of “Moving Forward” here at their Islamabad campus. The talk, an independently organized event, partnered with ACCA had a diversify range of speakers from different walk of life who shared their personal stories, professional encounters and growth along the way with students. Guest speakers included names like Mustufa Hyder Sayed Executive Director Pak-China Institute, Noman Choudry Founder Emiratecoin, Hajra Khan Captain National Football Women’s team, Uzma Yaqub a human right activist and recipient of National Award for Human Rights Services and last but not the least Yasir Jaswal, musician, writer, filmmaker and a restaurateur. They inspired audience with their personal and professional journeys, self-realization and augmentation that came along the way in areas as diversify as economics to women rights to exploitation to self-actualization that instigated among audience the courage to pursue their dreams above all odds. The event was highly applauded by all who attended and was termed as a fresh ingenious initiative to discuss and encourage ideas and thoughts.